The European Open Science Cloud (EOSC) aims to accelerate and support the current transition to more effective Open Science and Open Innovation in the Digital Single Market. It should enable trusted access to services, software, systems and the re-use of shared scientific data across research project, disciplinary, social and geographical borders. The recent EOSC High Level Expert Group (HLEG) report approaches the EOSC as a federated environment for scientific data sharing and re-use, based on existing and emerging elements in the Member States, with light-weight international guidance and governance and a large degree of freedom regarding practical implementation. The EOSC includes the required human expertise, resources, standards, best practices as well as the underpinning technical infrastructures. Despite the success of the European Strategy Forum on Research Infrastructures (ESFRI), fragmentation across domains still produces repetitive and isolated solutions. 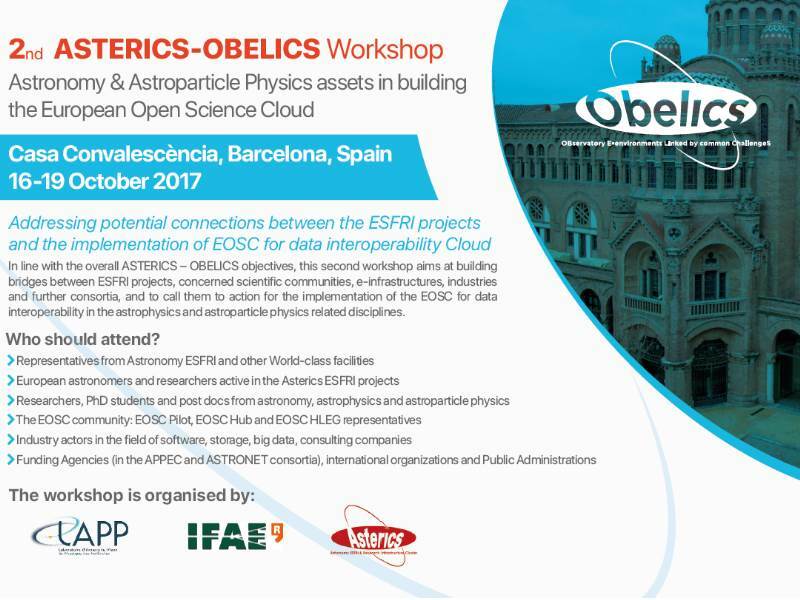 In line with the overall ASTERICS – OBELICS objectives, this workshop aims at building bridges between ESFRI projects, concerned scientific communities, e-infrastructures, industries and further consortia, and to call them to action for the implementation of the EOSC for data interoperability in the astrophysics and astroparticle physics related disciplines. This workshop is organized in the framework of OBELICS (Observatory E-environments LINked by common ChallengeS) work package of the ASTERICS project. The workshop is being organised by the French CNRS LAPP (Laboratoire d’Annecy de Physique de Particules) laboratory, the leading OBELICS institute and hosted locally by the Institute for High Energy Physics of Barcelona (IFAE), Spain, one of the partner of H2020-ASTERICS project. Day 1 will include presentations from OBELICS task leaders and task members highlighting achievements and research results so far. These talks will be open for External members to learn more about OBELICS activities. This day will provide an overview about OBELICS activities to the external members from EOSC, other H2020 projects, industrial participants etc..
Day 2 will include presentations and panel discussions with both EOSC and ESFRI projects representatives, exploring commonalities and complementarities between the two communities. Speakers and panellists will be asked to debate on how the OBELICS community can contribute to the work of the EOSC bodies on either a governance, funding or technical perspective. Day 3 will include presentations on Machine Learning and Artificial intelligence use cases for astronomy and astroparticle physics, and cases of adoption in the ASTERICS cluster of ESFRI and other world-class research infrastructures. ½ Day 4 will include a closed discussion among OBELICS members to discuss the outcome and future steps of OBELICS. OBELICS activities aim at encouraging common developments and adoption of common solutions for data processing, archive, analysis and access among ESFRI and world class projects in Astronomy and Astroparticle Physics, such as CTA, SKA, KM3NeT, EUCLID, LSST, EGO-Virgo, E-ELT.